Ah, how to explain La grande bellezza (The Great Beauty)! How to convey its cleverness, its beauty, its insightfulness? Oh, how we liked this one. Loved even! 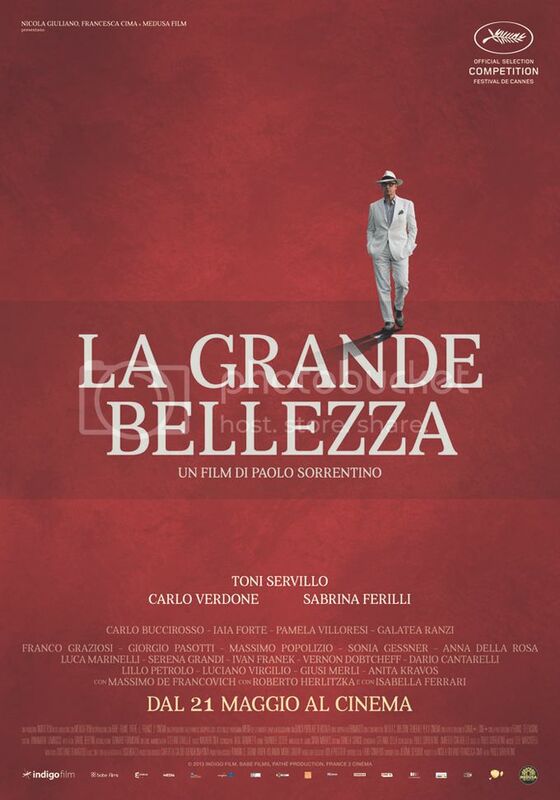 A spiritual sequel, even a spiritual remake, of that pillar of Italian cinema, La dolce vita, La grande bellezza follows Jep (Toni Servillo), an aging journalist and former novelist star who lives the high life in Rome. Sound familiar? The parallels with La dolce vita are numerous and blatant; the film is an homage and an update to that wonderful 1960s film of Italian decay. And if there's one thing Italy's good at, it's decay. The film opens on a blistering party scene on a rooftop somewhere in Rome. People grind, thrust, guzzle designer beverages and tear off their designer clothes. Insert lots of orgiastic, Calvin Klein wind machine faces. They're also mostly in their 50s and 60s, and they're gaudy, outrageous, luxurious and crazy. Honestly, this scene lasts nearly 15 minutes, and it's solely for a - admittedly wonderful - slow intro to Jep. It is brilliant. Following that, we meander through Jep's life with him: we attend his lavish parties, his avant garde art events, we meet some old friends and make new ones. And, over and over again, we're confronted with a sort of hedonistic nihilism that makes Rome feel like the end of the world (rather than the center of it, which is how it can sometimes also feel). Most of the scenes seem to take place in that nether hour just before dawn: the streets are empty, and the few people that you do see on the street feel surreal and alien. This is the universe Jep trafficks in, and - like Marcello before him - it's a superficially beautiful, "sweet life" that is slowly eroding Jep's spirit. Indeed, like Marcello, Jep faces a few shocks of grief and horror, and sometimes his despair shows through the cracks. Because this beautiful life - these beautiful buildings, wealthy people, endless partying - are a vacuum, an abyss, and Jep is trying to crawl out of it to, as he states late in the film, "find the great beauty". Of course, he realizes - and we realize - that there's no great beauty, there's only snatches of transcendental moments, of peak experiences, and then some terrible moments, the "wretchedness of humanity", and then a lot of "blah blah blah". You have to embrace the "fiction" of life and just cling to each other - it's actually a bit more of an upbeat message than La dolce vita (whose message was basically, WOE UNTO US ALL and FISH MONSTER). Don't ask us about the fish monster. We don't know what the fish monster was about. It's important to put this film, though, into the context of modern day Italy and - more specifically - Rome. First off, Rome has been in a state of luxuriating decay since, well, forever. Two thousand years ago, the city was also bumping and grinding to phat beats while the moneyed classes stumbled to their vomitariums. Actually, sorry, vomitaria (neutral, nominative, plural). Heck, we just finished reading a Stoic tract by Seneca, and even he was complaining - 2,000 years ago! - about the heedless, desire-driven pointlessness of some of these people's party-all-night lifestyles. So it's kinda a tradition. Of course, at least Rome was the end-all, be-all city 2,000 years ago. The intervening period - le invasioni barbariche (the "barbarian invasions"), the Middle Ages, the Vatican state - between then and now had an even more severe case of decay. Honestly, nothing's more depressing than 18th century Rome. There was a looooong period of neglect and exploitation at the hands of the Church, and, you know, dismantling the Colosseum to build the other stuff. And modern-day Rome! Ah, what to say of modern-day Rome. We lived there for two years, and both La dolce vita and this film very accurately capture a slice of Roman grandeur and Roman excess and Roman life. The high-end brands. The obsession with "la bella figura". The seductive, enchanting backdrop. The pointlessness. We don't know what it is, but there is something about the city which seems to turn off one part of your brain and activate another: it's hypnotic, drug-like. The two years we spent there still seem like a dream to us - remote and not part of our "real life". A vacation from real life. And we didn't even go to these parties! And then there's the Problem of Italy. Post-war Italy has been a tumultuous ride of constantly crumbling governments, a political circus, and - yes - the slow sucking of the Italian soul. You could even say this has been reflected in the slow erosion of Italian cinema: from the earnest, powerful glories of post-war neorealism, to the scathing, flirting-with-the-abyss stabbing political satires and commedie all'italiana of the 1970s, to the increasingly vapid and just plain idiotic recent stuff. Quo vadis, bel paese? So it's very common to consider Italy a big, beautiful, broken mess of a country, a place that's gorgeous but infuriatingly stuck. And this stuckness is economic, political, social, but also, well, moral or existential. And this existential decay is the perfect backdrop, of course, for a 65-year-old childless bachelor, drunkenly surveying his millionth roof party, saying, "I love our little dance trains. You know why? Because they go nowhere." Anyway, because of this - ahem - campanilismo in the film's themes and setting, we're not sure if this will appeal to any and everyone. Maybe, though? Certainly to the international intelligentsia. And that's fine - the film is gorgeously shot, Sorrentino's direction is unique and evocative, and everything is lush. And (like La dolce vita!) it drags a bit in the latter half, as we watch Jep's spiritual decline (or spiritual waking up, if you like), and is probably about 30 min too long. But that's fine, fine, fine. One additional aside: it blew the PPCC's mind to see Carlo Verdone in the role of Romano. Omg. OMG. This is OMG-worthy because Carlo Verdone was a huge star of populist Roman comedies from the 1980s and 1990s. We saw him on Ponte Sisto once! And he's a natural heir to the earnest, lovable-Roman-with-a-heart-o-gold stock character that was immortalized in the films of Alberto Sordi and (our fave!) Nino Manfredi. Indeed, Verdone even looked like an aging Manfredi, what with the tinted glasses and wounded air. His casting, his character's name, and his subplot were just great, fun meta. Romano is giving up on Roma, people! Good to see you guys back up and running with your racy reviews and recommendations...a real treat to read your blog. Look forward to seeing this one, just for the visual treat you promised.